It’s a bit surreal to be writing about a film about blogging through a book in a year, but that is what this magnificent film is about. Right at the start, I’m giving it a 20 out of 10 for content, poignancy, contrasts, magical moments and cooking, cooking, cooking together with love, love, love. It has been nominated for many awards, including several oscars – no wonder with the sensitive performances from all the cast but particularly from Meryl Streep and Amy Adams as the two women. The film is based on the blog of a young American woman, Julie Powell. To add extra meaning to her life as she approaches 30 she challenges herself to cook her way through every recipe in Julia Child’s Mastering the Art of French Cooking (originally published in 1962, and still available in paperback today.) Julie Powell, at her husband’s suggestion, decides to blog about her adventures. 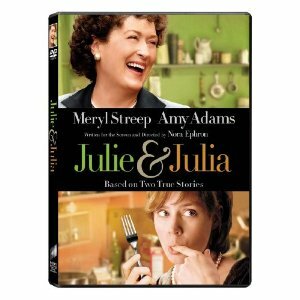 The film leaves us at the point where she is receiving countless offers to tell her story and ultimately spawns her book, Julie & Julia, my year of cooking dangerously. To sum up, the film is 120mins of escapism, humour, tenderness and insight into the two women. They are united, even though there is 60yrs between them. I’d love to know what you think about it if you’ve seen it. I suspect that it is a film you either love or hate. Only problem? HBTW is wandering around muttering Butter, butter, butter under his breath. Treat? Here is the youtube trailer. I haven’t see it. It is coming up soon on my list from blockbusteronline.com, and I’m eager to curl up one evening with a cup of cocoa and the remote control. Speaking of Julia. This past fall, my 10-year old son went out of his way to visit Julia’s kitchen here in Washington DC. A chef in the making?? I did see the movie and enjoyed. My understanding is that Julie was much more forthright in her writing sprinkling lots of swearing here and there and that might have been one of the reasons that Julia didn’t really want to know her and was not interested in the blog. Love this film…saw it on a rainy day in Helsinki, and to my amasement, husband and children all loved it too….we were the only family in the cinema and everyone else was a woman….don’t know why, coz it was very funny! Could it be coz it’s about a blogger AND and expat wife? It was all somewhat familiar. Also, when I told my US friends I’d never heard of Julia Child until this film, they went into a form of shock and needed treatment…which was also very funny! Thanks for the comments. I’m glad you liked it after buying it sight unseen Dianne and very impressed that your grandson wanted to visit the kitchen itself, I had never heard of Julia Child. It’s great to think of returned-scott’s family enjoying it in Helsinki. I will certainly look out for the other films mentioned.